Stories are more powerful than we give them credit for. We don’t remember sequences of events too well, but assemble those same elements in a particular order, interpret them through the lens of a narrative, and our brains suddenly take notice. It’s not just that stories make things interesting; they quite literally give meaning to our lives, allow us to understand things that happen to us, and—whether rightly or wrongly—provide a means of retroactively shaping our own experiences to fit with our knowledge of ourselves. Legion has been explicitly dealing with the difficulties of addressing history, and the fallibility of our senses, since the first episode. Sometimes, you need to take a step back from all you’ve been feeling and just try to approach things rationally. And, if you have trouble doing that, maybe it’s best to conjure a British version of yourself in your own mind to help you calm down and think. The first half of this installment is a lot of exposition, and it feels like some of the most straightforward and least inspired sections of the series. Credited writer Jennifer Yale and director Dennie Gordon do their best to keep these exchanges light and visually entertaining—Syd and Cary in the soundproof booth on the astral plane, Oliver and Cary walking through the reveal of Amahl Farouk as the yellow-eyed demon—but there’s no denying these are info dumps, albeit clever and engaging ones. 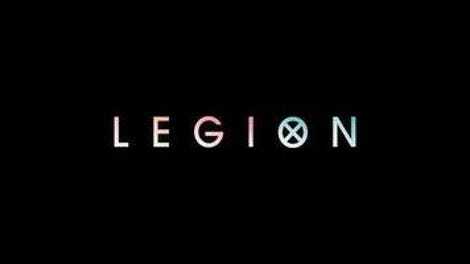 Legion has brought us all the way to the penultimate episode without a single previous sequence of this nature, so the fact that it feels the need to provide not one, but two conversations that do their best to remove any lingering uncertainties about what’s happening is overkill. And that’s on top of the necessary but also very straightforward (for this show, anyway) blackboard scene with David and his British rationalist counterpart. It was all good fun, but hardly exciting. But then. That damned silent-film act. From the moment we see Syd and Kerry rolling Rudy down the hallway in black and white, and the eye opens on the wall, Legion begins one of the most brilliant (and brilliantly executed) scenes from the entire season. It’s become almost predictable that every subsequent episode of the show gives the viewer something new and surprising to marvel at, but this was a tour de force of editing, lighting, structural invention, and the live-wire charisma machine that is Aubrey Plaza. I’ve been very impressed with this series, but the entire confrontation with Lenny while David escaped his mental prison left me gobsmacked. The editing: There was a storm of activity in not only various locations but also a variety of planes of existence, and the sequence fused them together with the precision of a ticking-clock thriller. From Oliver’s conducting the creation of a shield for Syd and David (literally made up of the world “shield”) to Kerry fighting the Eye to David running through the same rooms until he summoned the energy to blow it all up, individual segments that were superlative on their own added up to something greater. The lighting: It wasn’t just the black and white, put in place by Oliver’s glasses so that people could separate the true from the false. It was the black light on Lenny and the bursts of color that toggled between the true and false of the situation (retroactively lending the horror-movie opening of the episode even more potency) that rendered the Clockworks showdown a nightmarish intensity. And that doesn’t even address the beautiful color scheme filtered into the near-frozen time upstairs at David and Amy’s home, as everyone slowly returns to their bodies. The score lent an implacable menace to the events, while also smartly reintroducing the idea of silence, only with the addition of the intertitles, which managed to actually up the horror by making it all feel like it was playing out in another dimension entirely—as though there was nothing to be done and we could only watch and despair. But it all becomes a horrifying fever dream thanks to Plaza’s performance. This show has given her a role for the ages, and while she’s launched into it with gusto, the almost operatic miming of her sneering villain, and the way she doesn’t so much chew the scenery as let it all wither in the face of her intensity, sets an indelible tone and captures this series’ recipe of outsized drama overwhelming the all-too-ordinary people (superpowers be damned) caught in its wake. But despite imprisoning the Shadow King in a mind coffin of his very own, thanks to Cary’s machine, the biggest surprise doesn’t come until well into what we had mistakenly thought was the denouement, with everyone back at Summerland and Melanie happily ensconced with the still memory-loss-stricken Oliver. Suddenly, Division Three soldiers swarm the forest retreat and surround everyone, and we learn that the Interrogator survived the initial assault on his team back at the end of “Chapter 1.” Far worse for wear (“Third-degree burns,” he says of the results, with intense pain accompanying them), but alive and angry. So he orders everyone but David killed. You’d think he would know better than to try something like that, but revenge is an effective blind for the faculties. Besides, David might not even be David in the instant before the soldiers open fire: Lenny has busted a hole in her prison. And the interrogator doesn’t know it yet, but the Shadow King has some experience taking out Division Three goons. This won’t be pretty. The Eye’s death—both of them—made for an effective and shocking display of Lenny’s power. Oliver is a one-man soundbite factory. “My memory’s a bit… what’s the word… dishes.” Plus, he seems disheartened to learn his wife isn’t Asian. And he named his diving suit Jules Verne—fitting. Poor Rudy, stabbed to death by the Eye. But he gets one hell of a hero moment, grabbing Lenny and flinging them far from the others right before they all snap back to this plane of existence. End credits song check: “Art Of Fear,” by Nolan Green. Who could have guessed, just a few episodes ago, that Kerry Loudermilk would become the character that most tugs at the heartstrings? Her wounded accusation to Cary (“I needed you, and you left me”) is surprisingly affecting. Amy hasn’t yet put together the extent to which Division Three is a threat, wanting to call her husband and let him know she’s all right. I suspect she’ll be a bit more aware of the predicament now that they’ve overrun Summerland. Blink and you missed it, but there’s the ever-so-brief shot of an X-embossed wheel in the memory of David arriving at the Haller residence.